Fish herbivory is often overlooked in the aquarium hobby. By understanding the natural behavior of reef fishes aquarists can create better ecosystems for their inhabitants. One of the critical categories of behavior is feeding and foraging. This paper not only analysis fish herbivory patterns, but also describes the important role this knowledge plays in the home aquarium. 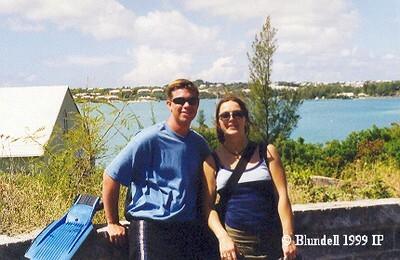 Researchers gathered and collected data along Bermuda islands. 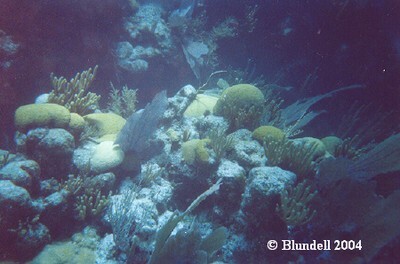 Data was gathered at varying reefs surrounding the Bermuda island chain. 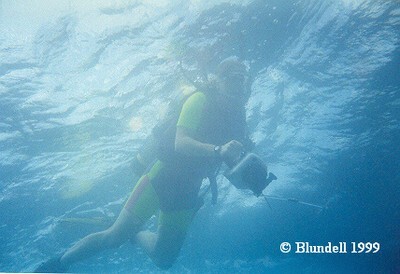 Many options for analyzing fish populations are available including diver reconnaissance, videotape surveys, still-camera photography (Putt et al, 1986). For this study diver reconnaissance using twenty five square meter quadrats were set up at varying reefs. Researchers took turn monitoring the quadrats, as they recorded the numbers of fish and identified the fishes seen in those areas. Divers also followed individual fish to record feeding sessions and frequency. While this proved to be a very difficult task, it did allow for direct observation. 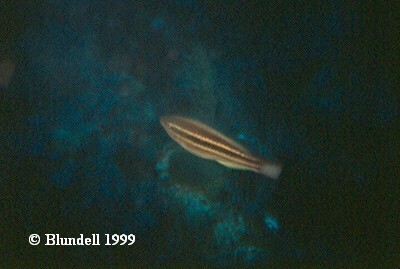 Identification was done by collaboration, using the book Reef Fish Identification 2nd edition by Humann (1994). This book was selected because of its clarity and resourcefulness, building upon the first edition as a recommended identification book (Sea Frontiers 1992). Monitoring was also performed byfollowing individual fishes, and recording the time frame and number of foraging events taking place. 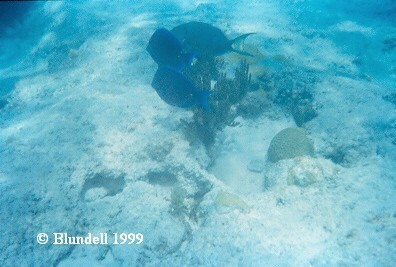 A picture of the reef system monitored in this study. 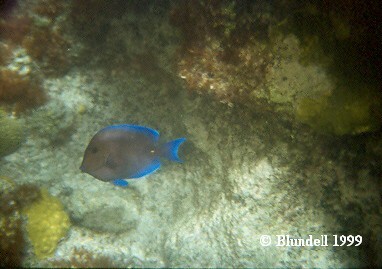 The blue tang (Acanthurus coeruleus) is responsible for much of the herbivory on Atlantic reefs. 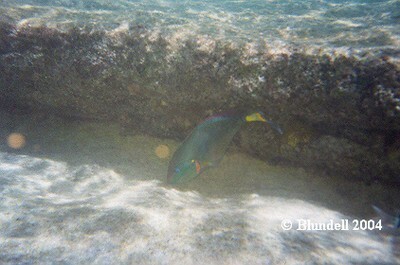 Parrotfish are important herbivores on nearly all reef systems. These observations display characteristics in feeding patterns of reef fish families. These patterns describe built in genetic characteristics that guide the feeding of fishes, which of course is tied directly into a fish’s health. In this study, three families of fishes were compared. The Scaridae (Parrotfishes), Acanthurdae (Surgeonfishes, Tangs) and Pomacentridae (Damselfishes) were all monitored, and grouped accordingly. 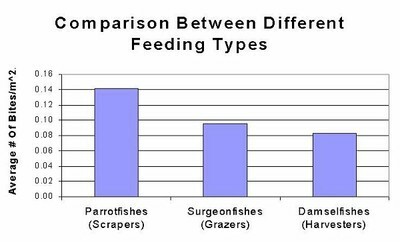 These groupings are useful since each family feeds differently; Scaridae being “Scrapers”, Acanthuridae being “Grazers” and Pomacentridae being “Harvesters”. 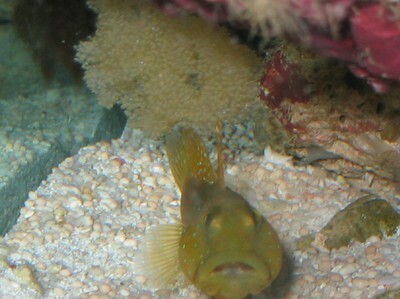 Scrapers are fishes that swim over a reef and physically remove the algae they eat by scraping it right off of the substrate. Parrotfishes are known for this behavior as they use their large beaks to scrape coral. Grazers differ from scrapers in that grazers do not remove all of the algae, and they leave the holdfast with the substrate. These fishes swim on reefs eating the fronds of algae and then swimoff. Harvesters differ in that they do not swim along the reef, but rather defend an area. These fishes will have homes on the reef where they defend a patch of algae and use it for food. Interestingly enough, fishes from different families often defend algal patches from other fishes, but with selective defense. Some surgeonfishes will not fight off some times of damselfishes (and visa versa) even though they forage on the same food sources (Robertson & Polunin, 1981). 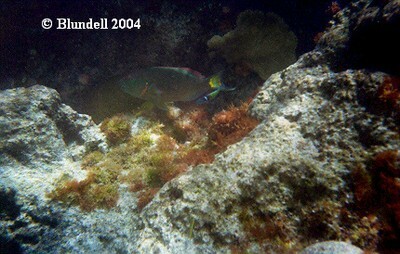 Figure 1 shows that Acanthurus coeruleus (Blue Tang) is responsible for the most bites taken on a reef, followed by Microspathodon chrysurus (Yellowtail Damselfish). However, as a family, Parrotfishes account for the most bites on the reef, simply because of the numbers of individual fishes. This is displayed by combining the individual species in Fig 1 to create Fig 2. It is important to note that numbers of individual fishes varies among reefs, exampled by Parrotfishes which are at greatlyhigher numbers in protected areas as opposed to those in highly fished reef systems (Alevizon et al, 1985). Higher numbers of fishes can greatly impact the future development of the reef. The herbivorous biting sessions described here can cause great impact on fleshy algae, thus leading to a reef dominated by crustose algae like Halimeda (McClanahan et al, 2002). Interestingly enough, the number of bites on the reef does not simply correlate to the number of individual fishes. What we found in this study is that species, and families, of fishes will engage in feeding sessions (# of bites between breaks of at least 3 seconds). Figure 3 shows how different species of fishes will continue to bite in long sessions, or in short feedings bouts. 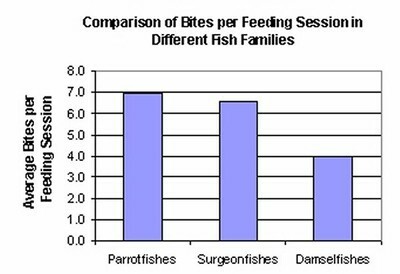 This figure shows Parrotfishes engaging in longer feeding sessions, followed by Surgeonfishes, and finally Damselfishes, but all results do not appear to be statistically significant or noteworthy, at this time. While all of these herbivorous fishes contribute to algal removal, the benefit to the corals is still difficult to gauge. Algal removal may be aiding in increased coral growth, but often times the herbivorous fishes responsible for this are also the fishes eating the corals (Miller & Hay, 1998). This statement is countered by studies showing that only one Parrotfish species ( Sparisomaviride ) actively feeds on live coral, while other parrotfishes feed on encrusted algae or non-living reef structure (Frdyl, 1979). Different families of fishes will spend different amounts of time feeding. The number of bites taken on a reef is dependent upon the number of bites a fish takes per minute, and the number of fishes on the reef. Feeding patterns of the fishes observed showed at least 4 bites per minute and averaged closer to 8 bites per minute per fish. This is important because in many home aquariums feeding is sporadic with a feast or famine type of mentality. These fishes are naturally continuous grazers, and available algal food is of great importance. Captive systems designed to replicate natural environmental conditions must have an abundance of algal growth. 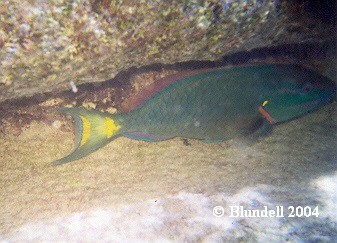 The Stoplight Parrotfish is a very common herbivore on the reef. Although all parrotfish have been reported as coralivores, other studies have shown that only S. viride (the Stoplight Parrotfish) is the only parrotfish that eats living coral tissue. The Stoplight Parrotfish (Sparisoma viride) is easily recognizable with its brightly yellow patterned tail. Although many herbivorous reef fishes are territorial, often times these reef fishes live peacefully with each other. A photo of the primary researchers in this project Adam Blundell and Silvia Martin. The first person I would personally like to thank is Silvia Martin. Silvia is an excellent biologist and was crucial in the development of the data used in this project. I would also like to thank the rest of the Coral Reef Ecology team who helped with the data collection and monitoring of the reefs used in this study. A special thanks is owed to the Advanced Aquarist Online Magazine for their support and publication of this study. Varying individuals, institutions, and funding sources were used, and all were of absolute importance to the completion of this project. My personal thanks to Exxon Mobile for their contributions. Alevizon, W., Richardson, R., Pitts, P., Serviss, G., (1985) “Coral Zonation and Patterns of Community Structure in Bahamian Reef Fishes”, Bulletin-of-Marine-Sciences; 36(2):304-318. Frdyl, P., (1979) “The Effects of Parrotfish Scaridae on Coral in Barbados West-Indes”, Internationale Revue der Gesamten Hydrobiologie;64(6):737-748. Humann, Pl, (1994) ” Reef Fish Identification Florida Caribbean Bahamas 2nd edition”, New World Publications, Jacksonville, FL. Mclanahan, T.R., Uku, J.N., Machano, H., (2002) “Effect of Macroalgal Reduction on Coral-Reef Fish in the Watamu Marine National Park, Kenya”, Marine and Freshwater Research; 53(2):223-231. Miller, M.W., Hay, M.E., (1998) “Effects of Fish Predation and Seaweed Competition on the Survival and Growth of Corals”, Oecologia;113(2):231-238. Putt, R.E., Gettleson, D.A., Phillips, N.W., (1986) “Fish Assemblages and Benthic Biota Associated With Natural Hard-Bottom Areas in the Northwestern Gulf of Mexico”, Northeast Gulf Science; 8(1):1-64. Robertson, D.R., Polunin, N.V.C., (1981) “Coexistance Symbiotic Sharing of Feeding Territories and Algal Food by Some Coral Reef Fishes From the Western Indian Ocean”, Marine Biology, Berlin;62(2-3):185-196. Sea Frontiers, (1992) “Coral Watch”, Book & Product Review- REEF Coral Identification. International Oceanographic Foundation, Sea Frontiers; November 1992, Vol. 38, Issue 6, pg 64.